A very popular Uniphase loudspeaker intended for use with models such as the Beomaster 1500, Beocenter 2600 and Beocenter 4600. 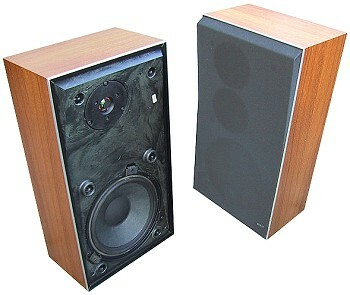 It was a simple 2 way model with a large woofer and a dome tweeter, both sourced from Philips. The front grille was shared with some of the more complex Uniphase models, so had holes for three drive units, though of course there was nothing behind the centre one. Text copyright © Beocentral. Unauthorised reproduction prohibited. Construction was typical of the smaller Uniphase models, the cabinet had wooden sides, top and bottom (veneered in teak or rosewood),a shaped resin front and back and a snap on grille covered in black cloth. Connection was via a recessed DIN plug. Text copyright © Beocentral. Unauthorised reproduction prohibited. Beovox S 35 was replaced by Beovox S 35.2. Text copyright © Beocentral. Unauthorised reproduction prohibited.